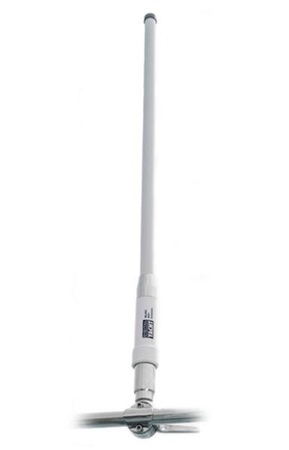 The WL450 is a smart wifi system with all the electronics encapsulated into its rugged 1m omni-directional antenna. It connects to PC or MAC systems via a simple network connection with power and data carried to the antenna via a thin ethernet cable. The WL450 is fitted with a standard 1" threaded base so it can mount onto a variety of deck, pole and rail bases available from many 3rd parties. The picture here shows it mounted with a 1" adjustable rail mount. Wifi hotspots are now common in many ports and marinas, many offer free or very low-cost access. However, with the WL450 you're not tied to local providers with its extended range capability and far more reliable operation than using a normal internal wifi card on a notebook. Once you have wifi access, the web can bring a plethora of useful information to your boat including TV and entertainment, media, weather, navigation updates, tracking, electronic charting, email etc. With a network interface, there are no complicated drivers or software to install. Simply enter the IP address of the antenna into any browser and you can access and adjust all the WL450 features and parameters. Simply scan for available hotspots, choose the best and click to connect. The power output and sensitivity for the system can also be adjusted. The interface is password protected. The range is dependent upon many local conditions but reliable distances of up to 3NM are possible with this system. The WL450 is also compatible with our iNavConnect and iNavHub routers allowing the wifi connection to be shared across multiple users.